I was gobsmacked to see a Sunday press graphic illustrating how 4000 rock drillers will earn the same this year as three Lonmin executive directors did in 2011. Appalled at such inequity, I promptly understood some real justification for this cauldron of turbulence and bloodshed. So I then interrogated the income comparative totals and found them baseless codswallop. At best, the current annual remuneration of 282 rock drill operators (RDOs) approximates to the quoted executive package total, which is still most alarming. However, for a news publisher – that I respect – to be wrong by a factor of 14 is simply outrageous, given such a highly sensitive and divisive issue. Over the next 24 hours, this ‘factual’ article was shared and debated widely across social media, and organized labour posted it via their online news review. I’ve no doubt that such seemingly credible reporting from a leading Sunday paper, with strong brand equity, found its way into these affected, strife-torn communities and has fuelled tensions further. 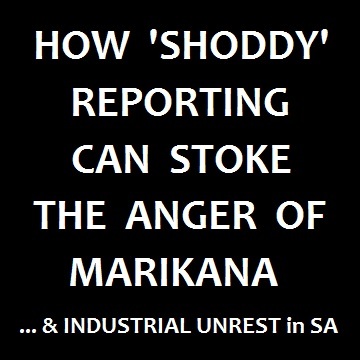 After global news media wrongly picked up that RDOs earn ‘R 3 000 to R 4 000’ monthly and were demanding R 12 500, it was reported that Solidarity stated actual cost-to-company (CTC) as R 10 521, excluding performance bonuses. Then, on 24 August, Lonmin issued a media statement clarifying their actual CTC was R 9 812,98, excluding an averaged performance bonus of about R 1500, across all RDOs, as I read it. Thus the average total CTC operator package is around R 135 000 annually. On 26 August, two days after Lonmin’s statement, City Press published their erroneous comparative income article, based on the union’s CTC figures, together with the tabular image from Media24’s Graphics24 division. Their report stated outgoing CEO, Ian Farmer, “earned more than R20m in 2010”, but that “4252 rock drillers in Lonmin’s employ will together earn total pay of about R44 million for this financial year” – i.e. just over double. Though City Press (and Graphics24) incorrectly relied on union figures, plus excluded then-known performance bonuses, the gross annual income for 4252 RDOs is actually about R 536,4m, and not the R 44m as quoted! All editors reporting on corporate executive and worker income disparities must be extremely cautious over basic computations and verifiable facts. Misinformation quickly leads to toxic inflammation, especially given our current workplace tensions and high unemployment numbers. I’ll now be sending this opinion piece of mine to City Press. I believe nothing less than a very public clarification piece is required of them – in print and online. What does the new term “toxic inflammation” mean? Bool, aside from the weblink being spread virally via COSATU’s Monday online news review (that reaches hundreds of senior office-bearers and interested parties nationally), I personally saw many FB posts & tweets with barbed, hostile and even somewhat poisonous comments over the seemingly massive income disparities. Personally, I think Marikana is a very complex mix of so many issues, some of which I would call ‘toxic’ and infected by polemics. Inflammatory comments have sadly prospered in that tragic space. « South Africa – home to “The Greatest Know on Earth” ?